Windows are to be as tight as possible and as insulating as possible (but as transparent for solar radiation as possible in the same time). 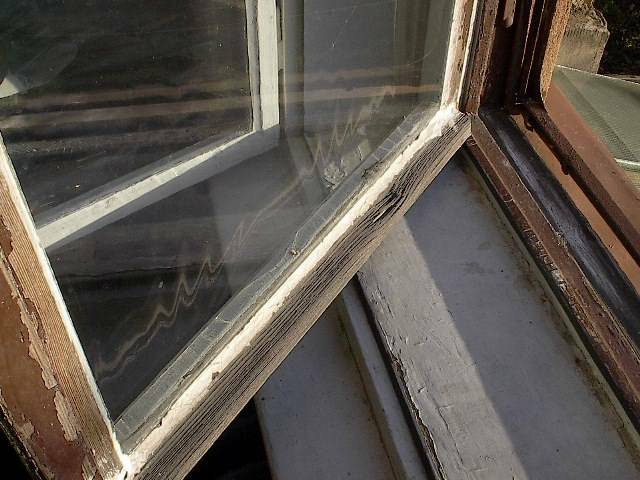 For old windows, two adaptations are quite easy to do. The most important one is to make them tight, it means at least draft-proof. There are several possibilities how to do that, the easiest one is to glue self-adhesive strips of polyethylene foam to the frames. On the two images of an old window, the strips are mostly black -- I had no white ones that time, but they are common as well. 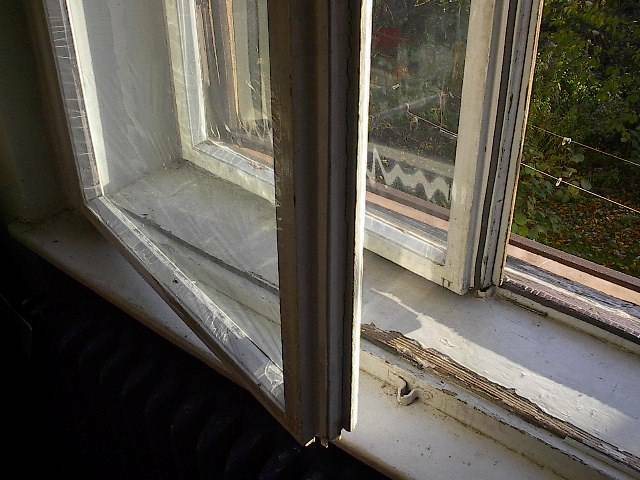 The strips are not eternal, these ones serve some four years already and at the central part of the window, serving often as a shelf in summer, a small piece of the strip is already missing (and should be replaced for the winter), it has been partly replaced by a white strip a year ago. An important detail is the moving part of the window, where the two halves touch with the stable frame. Even these joints should be as tight as possible, to prevent the interior moist air enter the cold space between the outer and inner window (the condensing moisture is the prevailing source of damage to the window construction, including loosening of the paint protecting the wood). On the inner wing, these strips are white. The strip costs some 0.2 Euro per metre in Czechia, it pays off surely within a year by saved heating costs, protects windows from damage and adds a lot to comfort (no too dry air in winter inside). Inner wings are to be tight perfectly, the outer not entirely (the air between the wings should be the exterior one, with few water vapour in winter). The really worn windows on the images (they should be painted, but it takes more time...) are more conspicuous by another feature, the foils attached to them. To the each wing, having the old glass on one side of the frame, a foil is glued to the other side of the frame. A double window becomes quadruple one this way. The foils are more transparent than glass and attaching them by a cloudy weather, you don't see if they are evenly stretched. These ones are not, and thanks to that they are visible on the image made by sunshine. Without sunshine, with closed windows, they are almost unperceptible from inside. Before adding the foils, the future hollow is to be connected with the air in the outer, colder space. Two holes are to be bored to the frame, one down and the other up. The holes should be filled with a dust-filtering stuff, as a strip of cellulose. The main labour when adding those foils is then cleaning the window panes. You would regret the dirty spots on the glass remaining inaccessible in the hollow later. When perfectly clean (sunshine is almost necessary for that), small pieces of a two-sided tape are glued to the corners of the frame, a roll with the foil glued there and rolled downwards, then attached better with a standard transparent tape at the top, cut with a sharp knife at the bottom, and glued by tape to the remaining three sides of the frame. Some foils can be then made more straight by heating them, if needed (by a hair fan, but that's not entirely easy). Two foils and two glasses are not the same insulation as four glasses. The foil is namely partly transparent even to the longwave infrared radiation, so makes a complete barrier just to the air movement. A quadruple window of this type insulates just a bit better than an alternative with an additional glass on just the outer wing. But it is much cheaper and a no-regret measure. Adding an ordinary glass would be a completely outdated measure. The only reasonable high-cost measure would be, changing the single glass in the wing to a best available double pane (insulating better than 1.3 W/(m2K)) with a non-aluminium spacer at its sides (such spacers are still rare on the market, so wait until they will be common).